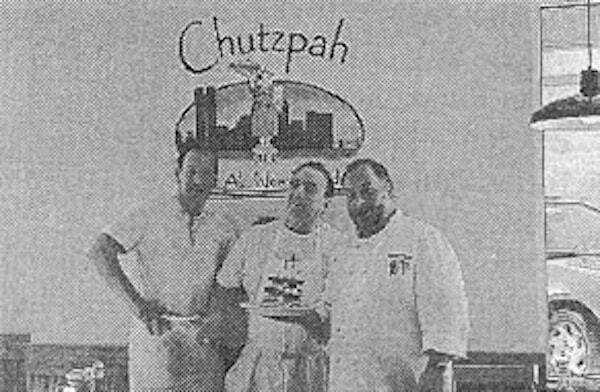 What makes Chutzpah unique, from all other deli’s in the area is when you enter Chutzpah you actually believe you’re in a real New York deli. From the aroma when you walk through the front door, to the pickles and homemade cole slaw placed on your table when you’re seated. 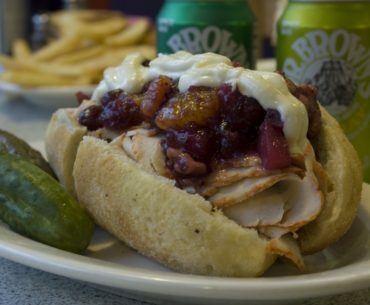 The sandwiches are over-stuffed, and the chicken soup is probably better than your grandmothers. They make their own corned beef, top rounds, brisket, chopped liver, salads, matzo balls, kreplach, and potato latkes. Just about everything else, including the smoked fish, pastries, and cheese cake are from New York. They even offer bagels and bialy’s. 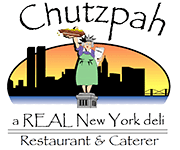 But don’t be confused, Chutzpah isn’t a local bagel shop trying to be a deli, they’re a deli who happens to offer bagels and bialys from, where else? New York. Passover is the eight-day observance commemorating the freedom and exodus of the Israelites from slavery in Egypt during the reign of the Pharaoh Ramses II. Beginning on the 16th night of the Jewish month Nissan, this year the first night of Passover is April 7. It’s a time that calls for wonderful family gatherings and special meals called Seders. What better time to mark a quest for a special matzo ball soup. 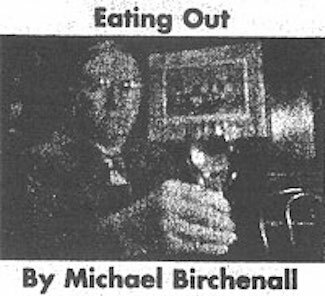 When I talked to friends and associates, I found all the recipes to be special, and all the favorite restaurant/deli chicken soups to be indelibly etched into psyches as fond memories. 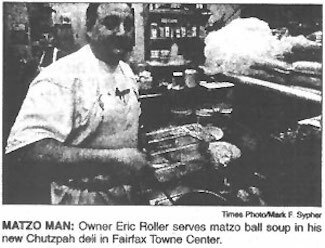 Now, Chutzpah deli open sin Fairfax Towne Center ready to make its own memories and traditions. There’s no New York style to suggest an attempt to rival the great New York delis. This is a brash declaration of chutzpah. But first impressions don’t give one the sense of New York, not in this garish center/mall off Route 50 in Fairfax. 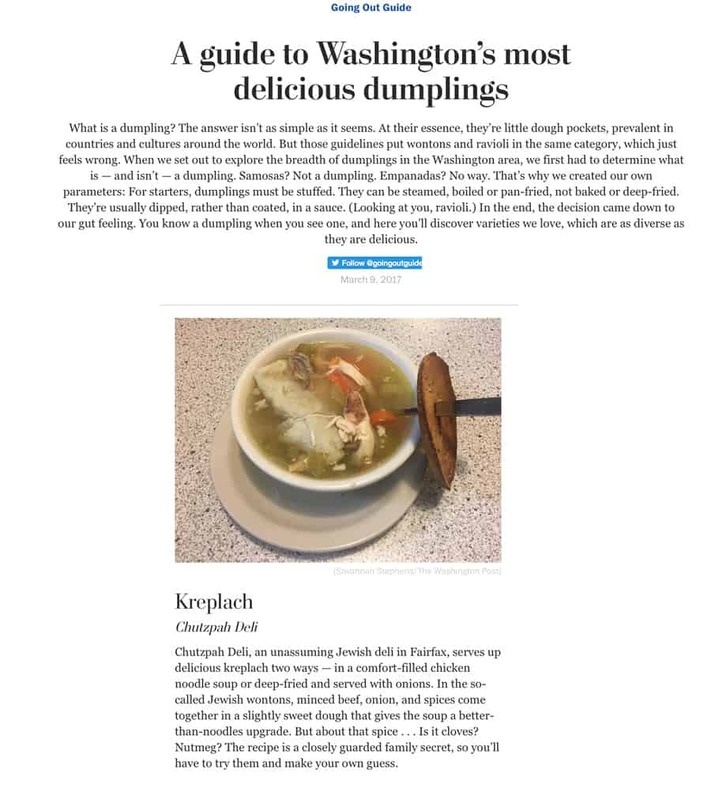 It’s not like walking in the neighborhoods of the lower East Village to grab a corned beef sandwich (no mayonnaise please) or a comforting chicken in the pot- guaranteed to cure anything that ails you-both available at Chutzpah. A hearty extension of the matzo ball soup, this Chutzpah favorite is a feast of chicken, broth, noodles, fresh vegetables, kreplach and matzo ball. New York doesn’t come to mind when you see the bright, new interior. And, they are really nice here. The person at the counter was engaging, helpful and a sincerely warm ambassador for the deli. I would go back, just based on the reception. But it’s the food that lives and breathes New York. Fresh chopped liver. Boiled beef flanken. Herring platter. New York cheesecake. Grilled Hebrew National bologna and eggs. It’s all about New York. Today’s mission is matzo ball soup-so I won’t dwell on the superb corned beef on rye with just the right spread of mustard and the heaping pile of warm, rich corned brisket. I talked to a friend who recounted a story of her favorite deli, where the regulars knew to ask for the corned beef under the the counter-to get the really lean slices. Not for me, I like it naturally sliced thin with just enough grease to complement the corned brisket. But no, we’re doing matzo ball soup tonight. Made from unleavened kosher matzo meal, matzo ball soup is traditional for Passover-to fanatics, it’s great any time. At Chutzpah, the soup is a stewlike concoction with thick cut celery and veggies abounding throughout. The noodles still have texture, so maybe they are added at the end, the way I do it at home. The matzo balls are huge and could not qualify as true floaters. In the glossary of matzo ball physics, you have floaters (many consider these the ultimate goal) and sinkers (those heavy failures we eat anyway). These were ‘tweeners, especially since they were so large, they needed a little more body to stay together. The chicken flavor is bold, and the salt is used with a tight hand, a delight to find these days. Now is it my favorite? I’m not sure if that is a fair question. Let’s say that it is for my world of Northern Virginia, but I found one that ‘l liked a little bit better-mine. At the beginning of this assignment, I canvassed friends and people I identified as matzo specialists. First of all, I talked to 12 people-and all had a favorite-except for one who said her mom’s were deadly weights planted on the bottom of the bowl. I came away with no recipes-a lot of promises but no recipes. I did get plenty of advice. The best came from the paper’s managing editor-Janet Rems-who uses the other common way to differentiate styles-hard or soft. The trick she says is this-if you want hard, thick matzo balls, cook not as long. If you want them soft. cook longer. If you stir the batter longer, it gets thicker and harder, and vice versa. To the Internet I went-and two hours later I went into the kitchen with my matzo meal and sheets of notes. I knew I wanted floaters-so I paid attention to tips that would lead me in that direction. First of all, I separate the eggs and beat the egg whites until stiff. I fold in the egg yolks after the egg whites are beaten and then add that to the matzo meal and salt (just a little). I oil my hands and roll them into the size of golf balls, not baseballs. And then I chill the matzo balls. I used real butter, used parsley and minced onions and a little white pepper. To cook the chilled balls I place them in boiling water and cover. Twenty minutes later, I had for real floaters; the key was to never lift the cover. I think mine are great – now that’s chutzpah from a gentile. No outside food or drink in our dining room. You wouldn’t bring a flask into a bar, would you? You want service? Keep in mind they’re servers not servants. Put down the cell phone and don’t be rude. Your Mother raised you better. We completely understand that they are children and will make a mess, you are not. Your server is your server not your maid. You see the mess, please help clean up after your child.